The rich are different, and not better, than the poor. 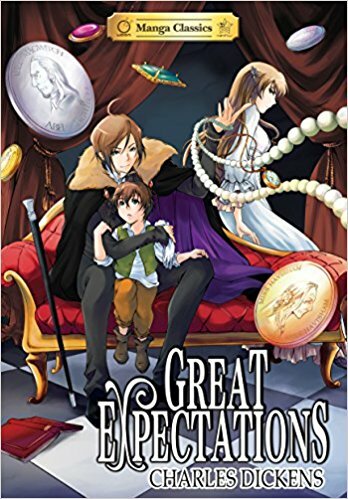 Charles Dickens classic novel, Great Expectations, is reformatted into a manga. The result is an excellent way to convince teens to read a classic tale. Great Expectations is the story of Pip, a pleasant helpful child, who is thrown into high society in the early 1800s. Young Pip is randomly called to entertain and assist rich, old and crazy Miss Havisham. There he falls in love with her stepdaughter, Estella, and even more with the idea of being a gentleman. Once old enough Pip becomes an apprentice blacksmith under his brother-in-law. But greater adventures await Pip as he receives news that an anonymous benefactor is paying for him to become a London gentleman. He has Great Expectations now. Personally I have tried slogging through the original 500 page novel and never made it even 10% in. This graphic novel makes reading the plot entertaining and faster though it is also over 300 pages long. The artwork makes keeping the multitude of characters easily recognized. I chose this version of Great Expectations because I have great memories of reading Classics Illustrated comics when I was a child. This manga gives the exact same feeling of making a great story accessible to modern readers. Great Expectations, the manga, is highly recommended for students who want more entertainment and enjoyment than simply reading the wiki. It is also recommended for adult readers who have always been curious about Dickens’ story but don’t want to invest 10+ hours to read the book. Thanks to the publisher, Udon, and netgalley for a copy of the book in exchange for an honest review.